Sausage is a food made of ground-up or chopped-up meat. It often has spices in it and is covered in a casing. Other meats, like the hot dog, pepperoni, bologna, and salami also are covered with a casing like a sausage's. Sausages often have meat from the animal's head, lips, cheeks, ears and other parts. Some have blood in them. Irish and English sausages normally have a lot of "rusk," or bread crumbs, and they are less meaty than sausages from other countries. Sausages may be used as a meal, in a sandwich, or in other foods like stews. 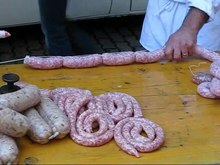 Many countries and regions have special kinds of sausage. Sausages are some of the oldest foods. This page was last changed on 27 November 2018, at 16:57.